M. is in the process of getting divorced and she is admittedly devoting herself almost exclusively to the pursuit of pleasure: dating, going to lots of parties, dressing up in wild costumes, taking burlesque dance classes, etc. I know from her emails from last week that this weekend she attended a huge dance party on a boat, and I saw photos of her decked out in amazing false eyelashes and glittery mask. Needless to say, M.’s life and my life could scarcely be more different right now. Her main “down time” to send me long gushy emails is when she’s bored during her day job as a paralegal. Mine is in the middle of the night when I’m pumping milk for Lucy. We try to find times to chat on the phone, but I am always tiptoeing around during one naptime or another, and she is always on the go to another event. We’re lifelong friends, so we are trying hard to navigate our friendship despite not only the many miles that separate us geographically, but the vast differences between our current day-to-day existences. I’ve known M. since I was seven years old, so I’m sure we’ll figure it out, but it may take some doing. I admit that whenever I receive these effusive messages from M. (which, these days, is very frequently), I am struck with competing emotions. On the one hand I am genuinely happy for M. because she really does seem to be doing well and having a grand time. On the other hand, it always leaves me with a glimmer of doubt: am I not having enough fun? When was the last time I sent someone a text message crowing about my uber-FUN (with a capital F) weekend? In a few minutes I’ll sit down and write M. a long-overdue email. 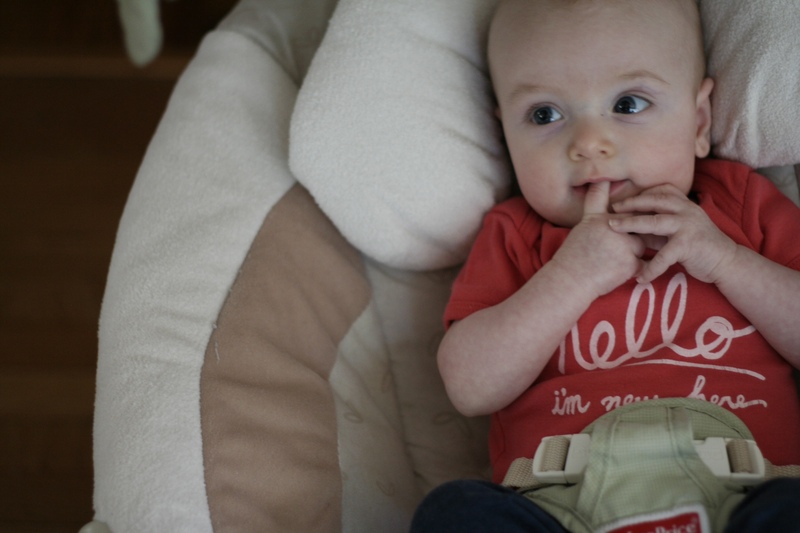 I’ll tell her how Lucy rolled over for the first time two weeks ago, and started making lots of funny and cute sounds. I’ll tell her how sweet my mom and dad are with Lucy when they babysit. I’ll tell her how my favorite part of the day is when Lucy smiles up at me from her crib. I’ll tell her that Hubs and I have reestablished our date nights and how nice it is to enjoy a good meal and a glass of wine and really focus on each other. I’ll tell her about seeing several of my best girlfriends this weekend and catching up on each others’ lives. I probably won’t use lots of exclamation points or emoticons. I will stop trying to compare my life to hers. And I will try to work my way back closer to M. — and to myself — by just being me.